The sterling silver Melodic Marquis ring is adorned with four 6mm by 3mm marquise cut simulated birthstones. Engrave up to 10 characters in each of four engraving areas. Import. given as a gift for mothers day thought the ribbons of sterling would be a little more delicate which would make the head or crown of the ring closer (smaller) I did get it with 4 stones so was kind of massive. beautiful workmanship and stones. 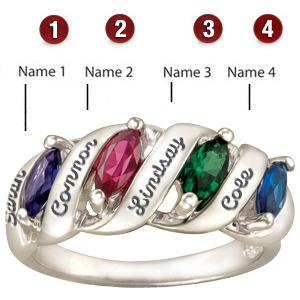 I bought this ring for my daughter for Mother's day, it's stunning , I'm impressed with the engraving of each name in such a tiny area , I love the style , and I know my daughter will be honored to wear it . The ring is absolutely gorgeous.